Music has always been an important part of my life. For as long as I can remember, I was singing! I'd sing around my house, I'd sing in the car... my first job was actually going from store to store 'caroling' with my sisters during an Easter celebration in the town my mom worked at. We were paid in gift certificates from the various stores in the area, but were even offered a regular 'gig' at a bakery there that featured local musicians. We did talent shows (and won) and attended karaoke nights. As I got older I participated in choir and school musicals. Every Sunday night, I'd also perform with one of my close friends. As you can see, music was important to me. 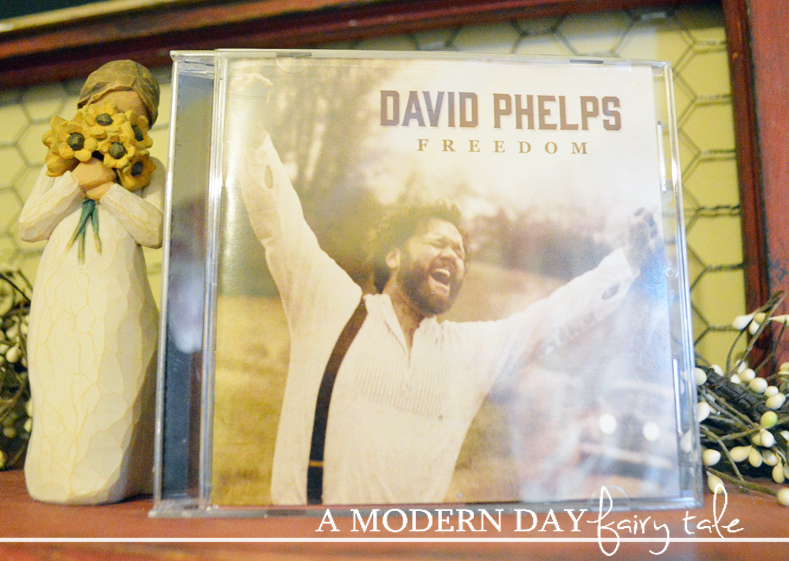 GRAMMY®-nominated, classically trained tenor David Phelps showcases his award-winning voice and three-octave range on his all-new recording,Freedom. Featuring unique arrangements of cherished gospel classics such as “We Shall Behold Him” and “Ain’t No Grave” as well as riveting arrangements of new songs, Freedom highlights Phelps’ unprecedented style and underscores his ability to bring music to life. Now, before receiving this album I had heard OF David Phelps, but never heard his music that I recall. I'd heard great things about him and knew he performed with The Gaither Vocal Band, but I wasn't quite sure what to expect, as I knew some selections from The Gaither Vocal Band were a bit old-fashioned for my taste. When I put the CD I was pleasantly surprised. David's voice is beautiful! A few songs had hints of country- such as Little White Church (perhaps my favorite on the album), while others were more classic hymns. Soulful, deep, beautiful... this was truly a fantastic album all around. Now, this wasn't the most contemporary selection in the world, nor was it the most get up and dance selection either. In fact, this would not be first on my list for those days when I throw on some music to energize myself... but for those times when I need a bit of relaxation? This is perfect. Listening to David's soulful sound, I cannot help to calm down and take in the words! Absolutely beautiful!